Octopus Brainstorming is an art science collaboration that has been evolving over the past five years. The octopus has an astonishing ability to change shape, color and form and has fascinated many throughout time – around the world it appeared in myths and stories. It has been used as a symbol of dark energy taking over in politics. But more recently neuroscientists, evolutionary biologists, technologists and roboticists are actively researching this mysterious creature. 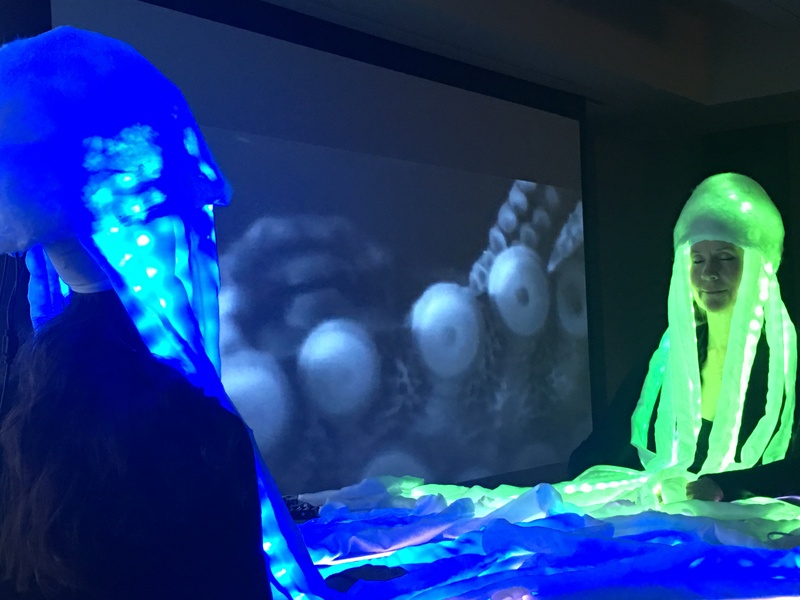 The EEG sensor array is embedded into color lit octopus crowns, giving the participants ceremonial presence while at the same time evoking the biological world of an octopus symbolizing embodied intelligence. The audience will have an opportunity to witness the power of non-verbal communication, sound and color in relation to our shared brain waves – in real time! Octopus BrainStorming is also meant as an opening to interspecies communication, as well issues around ecology of mind as Bateson presented long ago. Ideas of diversity in global language communication as well as preservation of species and our shared planet is ultimately what we want to brainstorm with the public. Victoria is an artist and Professor at the UCLA Department of Design Media Arts and is the founder and director of the UCLA Art|Sci center. With her installations she investigates how communication technologies affect collective behavior and perceptions of identity shift in relation to scientific innovation (PhD, University of Wales, 2000). Her work involves long-term collaborations with composers, nano-scientists, neuroscientists, evolutionary biologists and she brings this experience to students. She has exhibited her work in 20+ solo exhibitions, 70+ group shows, has been published in 20+ papers and gave 100+ invited talks in the last decade. Mark Cohen’s training is equal parts engineering and neuroscience. His contributions include his critical role in the development of practical echo-planar scanning, ultra-fast MRI applications, contrast-based and BOLD functional MRI, applications of linear systems analysis to increase fMRI sensitivity and resolution, and concurrent recordings of EEG and fMRI to better understand brain dynamics and distributed processing. He and his lab have contributed to an understanding of the power of pattern recognition and machine learning to both interpret/classify neural data and as a source of discovery of the processes that result in cognition, perception, emotion and pathology. Cohen holds appointments in the UCLA Departments of Psychiatry, Neurology, Radiology, Biomedical Engineering, Psychology and Biomedical Physics and is a member of the California NanoSystems Institute (CNSI).